Our Trendy Studio is the perfect bachelorette party venue and private event studio in Traverse City. Kids or adult parties! Work parties or bachelorette parties, kids parties or any other type of group outing looking to have a great time! 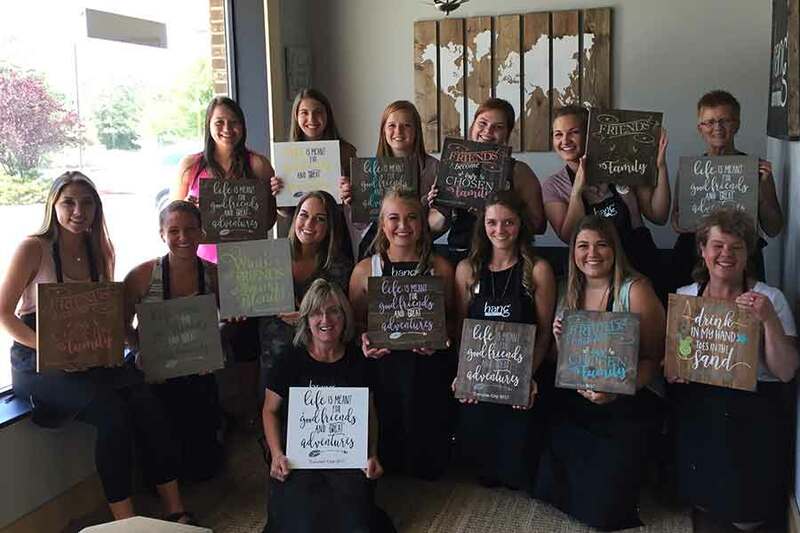 Book a sip and paint class today for your bachelorette party! Hang Workshop is the perfect party or event venue in Traverse City for any type of party. Enjoy your group work outing at our boutique style workshop and create amazing wood signs and projects! Our party venue specializes in taking care of the details and providing the materials and instructions for a variety of art and craft projects and budgets. Our party venue offers a range of options from kids or teen parties, bridal showers or bachelorette party, date night, fundraiser or a girls’ night out! Remember, it does not have to be your birthday to party at our event venue in Traverse City. Two serving areas for your byob wine and painting event. Sip and paint away while you enjoy snacks, cakes, drinks and invite your friends to the trendiest party venue in Traverse City. Let us facilitate the fun painting class and clean up the mess up afterward. At the end of the painting session, everyone will be amazed at the artwork they have created. Ask about a custom design if needed for a large event. We are happy to cater to specific needs and create the painting class your group or party will love! How do I book a private party or event? Dates and times are largely flexible in our party and event venue located in Traverse City. Book early, as party venue slots fill fast! The workshop is available M,W,Th F,S for private events and parties with exceptions of scheduled public workshops as shown on our calendar. The private event will be added to the calendar and named so you can share the event with your group or send them a link. Your guests can then each individually register and pay for themselves. They can choose their own design for your private event and you don’t have to handle money! You can book our event venue with parties of 10 or more and each can paint an individual wood sign design in the colors they choose once they arrive. Look on our calendar to make sure the day and time you want is available and call us at 231-620-4750. A $75 deposit will be required for booking the party event venue in Traverse City. Once your group of 10 or more arrives, the deposit will be returned to you. If the party cannot meet the minimum 10 guests, consider reserving a private table or two in one of our scheduled workshops. Private wood sign painting class events last from 2-3 hours depending on the project and Traverse City children’s parties and events are booked at up to 2 hours. You are welcome to bring your own wine, beverages, appetizers, or cake. We have two serving areas to make your corporate event or party shine at our Traverse City party venue. Please also bring plates, silverware and napkins if needed for your private party or event. We only request that no beer or wine will be permitted at our venue when hosting children’s or teen parties. After the private party or event, we will clean up for you! You will enjoy this one of a kind trendy event venue for your Traverse City party or event! Bachelorette Party- you should see our clever wedding workshops. Kids Party-It doesn’t have to be a birthday to have a kids party! All occasions, groups, etc. Adult Party- BYOB to a private ladies night or date night group! Housewarming Workshops- Build a grouping of decor for anyone’s new home! Corporate Party or Outing- This event venue is nothing like the corporate events they are used to! Surprise everyone with fun! Girls’ Night Out- ladies nights, mothers groups like team moms and gals that just need to get away and have a good time! Youth Team Event- Sports signs, groups, of any kind. Great for teens and tweens wanting to hang out and have fun! Festive Events- Seasonal, themed, and trendy classes. Get everyone together. Tis the season! Mother/Daughter Day- Get together with other moms and enjoy a great time. Book a private party or event at our party venue! Family Day- Family in town? Make us part of your night. Go to our party venue and get everyone out of the house! Just Because- It does not have to be Christmas or a birthday to have a party. Our event center is open for all of your party or corporate needs. Please fill out the form below to register for a private event. Roughly how many people will be attending the event? Please give is any information on the event you may think is pertinent for us to know such as special requests, event type, etc.